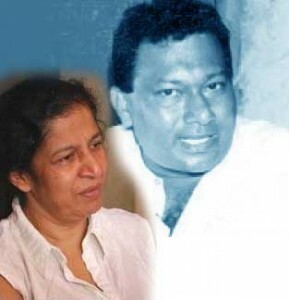 Sumana Premachandra the widow of late Bharatha Lakshman Premachandra is appointed as a coordinating secretary to the President Mahinda Rajapaksa. A letter signed by her shows her official designation and her office address as; Presidential Secretariat, Galle Face, Colombo 1. Her appointment is unknown to many people who are in the campaign “justice for Bharatha”. Below we give the said letter. Whether she is qualified or not she is given a job. There are mothers who lost their unmarried sons in the army in fighting and they got the pension or a collective sum from government and suddenly economic situation of these mothers rose up? So some times death becomes a blessing in disguise. This is how this regime pacify & deceive victims, without arresting the killer who they know where he is. Most of our Sri-lankans are very selfish who have no regards or respect for Husbands or children they opt for perks & money. I refer to both women wife of Bharatha Laksman & Jeyaraj Fernandupulle. …Jeyaraj is the guy who sat for the law exam on behalf of Idi Mahin and Idi Mahin is the one who bumped off Jeyaraj for various reasons…..
What money and position can do in a gluttonous society sans self respect? Ha Ha Ha!!! Where is Hirunika Premachandra? At the feet of her “Second Father”(“Janadhipathituma mage deweni thaththa!!!”)? Ha Ha Ha!!!! Prostitution of the highest order. Don’t be surpried if these two women say that their Husband/ Fanther was never killed!!! MR gives Jobs like a Santa Clause because he is not going to pay the Salary and perks but the Tax Payers of this Country. This i politics of Sri Lanka. Hirunika I feel sorry for you. She will know the reality of this appointment when the case against Duminda Silva fails due to lack of evidence. Already manipulation of evidence to achieve this has commenced – only one gun has been produced by police though Premachandra had 42 bullet wounds,Duminda Silva had 3 bullets in his skull & the other three dead must have had at least 3 wounds each. As usual, the postmortem report is kept a secret unlike in the old days.The single gun, after handling by police for a month,was sent for fingerprinting after “permission” by court,though this was totally unecessary & is routine in a murder investigation.Duminda Silva will never face trial & even if he did, verdict will be that he is mentally incapable to give evidence – he was earlier exonerated of murder as police produced a medical certificate saying that he was “mentally incapable”! The vociferous daughter, a law student,will learn the reality of the law as it is practiced in sri lanka. Was all the crying by both the widow and daughter just an act. this should be a good script for a teledrama. They very well deceived the innonocent masses who stood by them I happened to be one. This is a disgrace brought upon all widows whose husbands died atwar. They are HEROS in comparrison to this wife and daughter. Poor Bharatha Luxman he would have wanted justice so that killing of this sort (Inorder to get rid of a pal to appoint a drug lord in his place.) would never be repeated. I doubt if this woman will ever be happy since she shamelessly committed a treacherous act. My thoughts go back to history where Hallapolla’s wife killed her own children rather than stoop to the demands of the King. Don’t be surprised if Anoma Fonseka will follow the same. We, the general public, are fools by not accepting the fact that everybody is after money and power. So she too will pass her law exams with flying colors. It would be better for mother and daughter to sell their bodies than their soul. What a wonderful human being Bharatha was and these two women have sold his soul. This is justice a la Rajapakse style. If this woman had any shame she would not have accepted this appointment. Obviously there is no decency and justice in this country since late 2005. They very well deceived the Innocent masses who stood by them I happened to be one. This is a disgrace brought upon all widows whose husbands died at war. They are HEROINS in comparison to this wife and daughter. Poor Bharatha Luxman he would have wanted justice so that killing of this sort (In order to get rid of a pal to appoint a drug lord in his place.) would never be repeated. I doubt if this woman will ever be happy since she shamelessly committed a treacherous act. My thoughts go back to history where Ehellapolla’s wife killed her own children rather than stoop to the demands of the King. world? SL will be unique in this way. 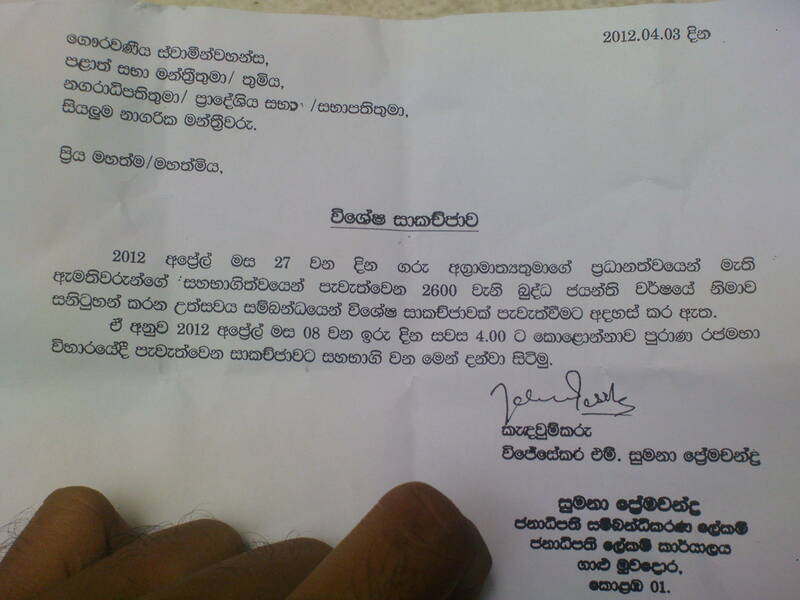 Criminals know how to GOVERN sinhala society. Baratha’s siblings in Canada have joined hands with LTTE sympathisers to attack the government of Sri Lanka. Don’t know what are they going to do now??? Baratha had given loans more than [Edited out] Million Rs. Now his wife is trying to recover this money and had filed a law suit. How can a person who is not a member of Parliment made this amount of money to give to others for high interest. See Diwaina of April 20th. Oh My God Swarna..How much did you get from your Sibling? We agree that you played a big role to band LTTE in the west. Any way do you accept the fact the Tamil had genuine grievances to fight against the Sinhalese dominant government to get their democratic rights? Yes, I am like my brother who together with Vijaya kumaranathunga beleived Tamil people have genuine grieviances. But I don’t beleive in taking up arms and fight. It is the people power I beleive in. All dictators in the world are going down one by one with people power. that is not very far as far as Sri Lanka concern. Many bad things have been said about Bharatha but also many good things have been said about him. It was said that he was a kind man who helped a lot of people. He was also not a racist and made this clear by his actions. It is a terrible shame that his daughter and wife have joined with those who murdered him. What a betrayal by the wife to lick the toes of the people who killed the husband? Unless it is a master plan to get at Mahi from within? As a coordinator I suppose she get a lot of information including kudu business of Sudu putha (Du-mi) which her beloved husband fought against! Anichcha wacha sankara to the surviving wife ( nothing is permanent not the feelings including love towards the dead husband, statements given to the public after the funeral and misleading people who are trying to bring justice to her husbands killing ABSOLUTE BETRAYAL- I hope this woman can read the postings – or is she literate enough to understand what she has done!!! You never spoke when others were abducted, made disappear and Extra judicial killings took place. You never asked Other than in you fathers case, where is justice or rule of law in this country when many violations took place. As usual when it happened to your own father, you started raising your voice. Even it was too late to save your own father,yet your voice made some hope for justice. We will just wait and see whether your family is going to use the powers of a coordinating secretary to the President, to continue your so said struggle for the justice for your father or just go silent to keep the well paid secreterial post to do what they want? Baratha had given loans more than 75 Million Rs. Your brother was a Ticket Checker (Tikka) in CTB. This was before enter into politics. How come he made such a wealth? May be you gave him this money from God Blessed Canada?